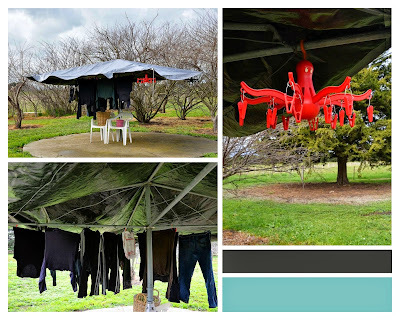 Hamby Home(in)stead ...: Tarp de - um - clothesline! Tarp de - um - clothesline! We thoroughly enjoyed a beautiful day of continued sunshine today. It was lovely! The weather is definitely variable here. It doesn't just change once but can vary many times in the space of a day - and that's probably one of the trickiest things we've had to adjust to since relocating South. I'm still coming to terms with the cold - and the changeable climate. It's quite tricky. We've had some memorable outings this winter. There was our misty Mount Macedon picnic and some geocaching in gale-force winds! Those are extreme examples but we had a number of cold-weather picnics too, where we were very glad of our thermoses. As I've said quite a few times lately, if we sat around waiting for perfect conditions, we mightn't go anywhere at all! Of course, the constantly changing conditions play havoc with the more mundane missions also - particularly drying our washing. When we first moved in to Hamby Home(in)stead we were hit with a horrendous electricity bill. I was absolutely stunned when I read the figures. We've since paid that off, double-checked all settings on the meter and changed electricity provider. Even so, we are still not tempted to turn on the under-floor heating, stopped using the dishwasher soon after arrival (due to tank water restrictions) and limit our use of the clothes-dryer. Last winter we had clothes-airers set up permanently in the lounge-room. Obviously that wasn't an ideal solution - and I scorched one of Vaughan's school jumpers when trying to fast-track it's drying! There is very little outside covered area at Hamby Home(in)stead but I've found space for one airer in a lean-to area outside the laundry door. I started pondering other possibilities and remembered that a previous neighbour (back in New South Wales) had a clothes-line cover. It was something like this. They cost about $200.00. I suggested to Nick that a tarp might do the same job. Nick agreed and we bought a 12-foot square heavy duty version from the local camping shop. $40.00 total! Nick rigged the tarp over the line a few weeks back. It's obviously not as neat as the commercial cover but works well. Heavy rain pools in one area, so we need to tip that off from time to time but otherwise all is fine (hah)!